Congratulations! You’ve just taken your first step towards the ultimate dare-devil thrill – a Tandem Skydive! For adventurers, the curious, and those not afraid to face the fear, a parachute jump is quite simply an awesome experience. In fact over 30 brave supporters took on a skydive for us in 2018 raising over £20,000 in the process! We are now recruiting people just like YOU to take on the challenge for 2019. Taking on a SKYDIVE to raise funds for Zoës Place Baby Hospice will give even more meaning to your experience and will be an amazing achievement to be proud of. A Tandem Skydive is the easiest way to experience the thrill of freefall followed by an exhilarating canopy ride without becoming a qualified skydiver. After a short briefing you will be ready to jump from 13,000 feet strapped to the front of a Tandem Instructor who is there to control the skydive for you. Once you exit the plane you will accelerate to 120 mph, covering each thousand feet in approximately five seconds. At 5,000 feet the Instructor will deploy the parachute which will then be controlled by both persons until you land softly and gently some four minutes later. Most people have no problems. The weight limit for Tandem jumps is 15 stone and these weights must be in proportion to your overall height. You do not need to be in excellent health to do a Tandem Jump but certain conditions may effect this so if you are in any doubt then please consult your GP. A letter of parental consent is required if you are under 18. The minimum age for parachuting is 16 years and there is no maximum age on this course. Currently there is no upper age limit for Tandem Skydiving and as long as you are physically fit and healthy you can self-declare by completing BPA medical form 115A. (enclosed). If there is a doubt about fitness or where existing medical conditions require the advice of a doctor then BPA medical form 115B must be used. This form, (115B) must be stamped and signed by a doctor and brought to the centre on the day of your jump. 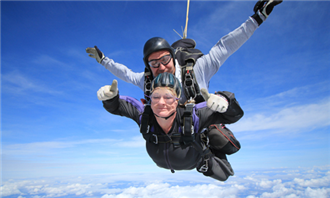 How will my Skydive Help the charity? The balance of funds after we have paid for your Skydive will help us meet our charitable objectives. To protect the charity against financial loss we would expect you to have paid at least £100 of your sponsorship no later than 4th February 2010 with the balance of £300 sponsorship to be paid at least 14 days before your event date. Where does the Skydive Challenge take place? With years of experience and first class instructors Hinton Skydive Centre will ensure you have the most fantastic experience. Your friends and family are also very welcome to attend your experience and will have a perfect view of your ascent, descent and landing back down to earth! It is your responsibility to make your travel arrangements however a Zoë’s Place representative will be there to meet and greet you on the day and to make sure everything goes smoothly. What support will I have with achieving my fundraising target? Once we have received confirmation of your booking we will email you an Information Pack full of fundraising advice, sponsor-forms and information about Zoë’s Place Baby Hospice. We can also provide you with inspiration, collecting tins / buckets, balloons and banners for any fundraising events you may be organising.